King George’s Medical University (KGMU) in Lucknow will soon be performing very affordable Bariatric surgery (procedure to help people get rid of extreme obesity), at its surgical gastroentrology department. This is implied in claim by its doctors that the university will do the surgery at one-tenth of the cost charged in the city’s private hospitals. This new development, in turn, should spell good news for the patients, as this will create a price war situation with private hospital likely to revise their rates. Bariatric surgery is a surgical procedure which involves using a gastric band, or removing a portion of the stomach or by re-secting and re-routing the small intestine to a small stomach pouch. KGMU has recently performed its first surgery by a team of gastroentrological surgeons and anaesthetists at KGMU. There have been proven medical benefits of undergoing this surgery for people with a BMI of 35 or more. Most of them have had a permanent cure of diabetes or hypertension in addition to sustained weight loss in more than 70% cases. As reported by TOI, head of surgical gastroentrology, Dr Abhijeet Chandra said keyhole bariatric surgery was performed on a 40-year old severely obese female patient. “She weighed more than 104 kilograms and was suffering as her weight was causing joint pain, hypertension and high cholesterol,” he said. 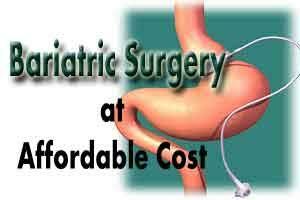 The patient was aware of bariatric surgery but could not afford it as it costs anything between Rs 2 lakh and Rs 4 lakh in the private sector. “But in KGMU, she spent a total of about Rs 35,000,” said Dr Chandra. “The strategy was planned keeping in mind individual problems of the patient. The procedure took around 2 hours. The stomach was divided to reduce its capacity to 150-200ml to decrease her food intake and craving for food by producing hormonal changes,” explained Dr Chandra. I am from hyderabad . I my self want this surgery …Thanks Dr Abhijeet and team.. If possible please inform the procedure and precautions.